I don't have any photos of myself taken at Christmas time from when I was growing up, and perhaps because of this I have very few memories of Christmas as a young boy. I do remember getting the likes of Lego, farm sets, toy tractors, Airfix, but the best of all was Mecanno. Myself and my brother Joe had hours of fun making everything - it was a great way to learn about screws, nuts, connecting things, reading (and following) instructions, and solving problems. I regard myself as handy enough around the house, I can definitely trace this back to Mecanno. At home in Ballingate, Christmas dinners were a fantastic affair. My Mum certainly knew how to cook up a huge turkey and ham. Red lemonade was a special treat at our dinner table, and plum pudding to die for with delicious brandy sauce - great tastes and memories. I haven't had Christmas dinner in Ballingate since 1990, though we do always meet up on Christmas Eve for lunch. Later, when we had our own children - we of course recorded events and memories are a little closer. When we got married (in 1986), Roma and I did alternate Christmases in each of our families - 1992 was the last time we did this. We used to drive down to Castlebar on Christmas Morning - in the days before by-passes we seemed to get stuck a lot with Mass-going traffic in towns along the way. Since then we have mostly spent Christmas Day in our own house. 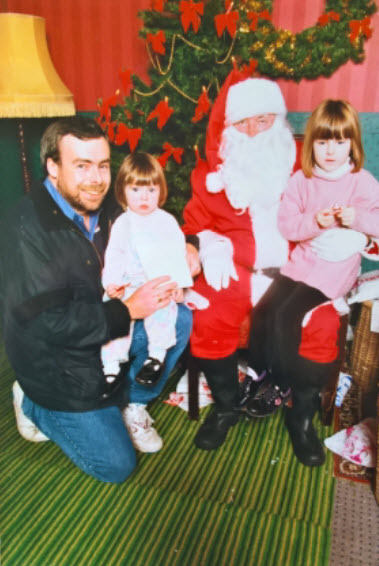 The photo to the right is (I'm guessing) from 1992 - Kate, Claire, and myself are visiting Santa, probably in the Blackrock Shopping Centre (I love Santa's black wellies!). Despite long queues and rubbish presents - Santa was always in good humour. Children today will obviously have lots of photos and videos to remember in years to come. Memories will be available at the click of a mouse button. I am envious of them as I'd love to look back on selfies from the 1960s or a snap of me making a rocket out of Mecanno.